East Sussex Music and East Sussex Schools present the Big Sing for 2018. In collaboration with Glyndebourne, the University of Sussex School of English. 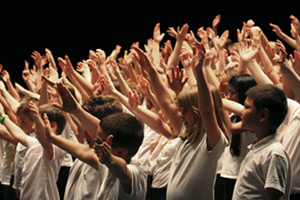 Our annual celebration of the festive season features a programme of songs, words and music performed by over 2000 primary school children, students from The University of Sussex and East Sussex Music’s flagship orchestras, choirs and bands. We present music for the winter season and specially created words written by our children.